Jacoby will be presenting new work in her exhibit entitled the Shape of Sky. 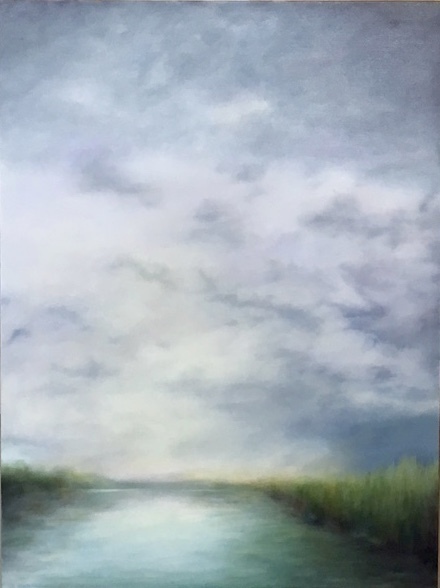 Working in oil on canvas, she creates representational landscape paintings that reflect nature and particularly the sky. Vivid Art Gallery will host an art opening for Featured Artist Susan Jacoby on November 2nd at its monthly First Friday event. The opening, which runs from 5-8 PM, is open to all and is free of charge. In addition to great art, there will be a raffle and refreshments, including freshly baked biscotti and the gallery’s signature “Morisot Mule” cocktail. Live jazz will also be playing at the gallery to round out the evening. Jacoby will be presenting new work in her exhibit entitled the Shape of Sky. 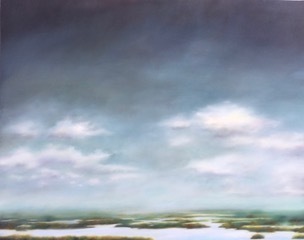 Working in oil on canvas, she creates representational landscape paintings that reflect nature and particularly the sky. About her inspiration she says, “Water and sky provide a wealth of ever-changing patterns. More important to me than the land, water, or sky is the light or atmospheric conditions like fog or bright light that blurs objects and allows others to emerge.” Using vibrant blues, oranges, and greens, Jacoby creates glass- smooth surfaces with no apparent brushstrokes. The result is paintings of great beauty and incredible calm.